This decadent risotto is made with Amarone della Valpolicella, the prized red wine from the Valpolicella region in Northern Italy's province of Verona. This distinguished, unusual wine is made from partially-dried grapes, giving it a particularly fruity, raisin-y flavor and a rich, full-bodied character. Risotto is a traditional Northern Italian dish, and so this recipe combines two of the Verona area's greatest culinary treasures in one. Adding some red radicchio, as suggested below, would bring that number to three! It is quick and easy to make (it can be ready in less than 30 minutes) and would be an impressive first course for a dinner party. Serve the finished risotto sprinkled with grated or thinly-shaved aged Monte Veronese cheese (another Veronese specialty), Grana Padano, or Parmigiano-Reggiano. Optional toppings for serving include: grilled red radicchio, toasted chopped walnuts, and/or crisp-fried bits of pancetta, prosciutto, or bacon. In a separate, nonreactive saucepan or Dutch oven, gently heat the Amarone wine and, as soon as it reaches a bare simmer, add it to the rice. Continue cooking the rice, stirring frequently with a wooden spoon, until the wine is absorbed, about 16 to 18 minutes. Add a bit of vegetable broth, as needed, towards the end of cooking. When the rice is cooked to al dente consistency and the liquid has reduced to a creamy sauce, remove the risotto from the heat and add the remaining 3 tablespoons butter and the grated cheese. Stir until well combined, season to taste with salt, and serve immediately. Serve the finished risotto sprinkled with grated or thinly-shaved aged Monte Veronese cheese (another Veronese specialty), Grana Padano, or Parmigiano-Reggiano. 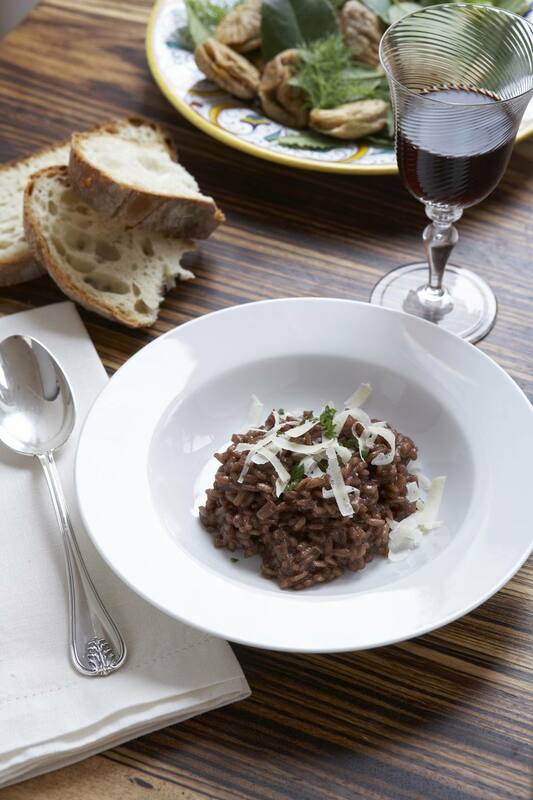 It makes sense, of course, to serve this risotto paired with a glass of Amarone della Valpolicella wine!